Metastatic prostate cancer, or prostate cancer that has spread to other organs, is incurable. 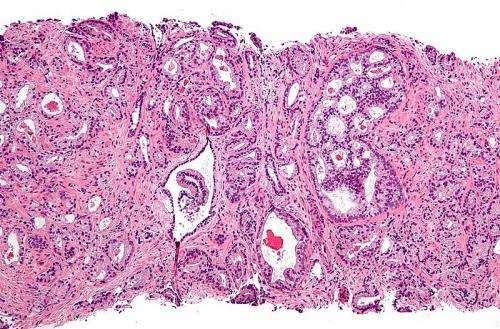 In new research published in the journal Science, Roswell Park Cancer Institute scientists have identified two gatekeeper genes that allow prostate cancer to progress and resist treatment. Their work illuminates the mechanisms behind lineage plasticity, the ability of prostate cancer to adapt to therapy, and highlights opportunities to disrupt and even reverse this deadly process. "Androgen-deprivation therapy is commonly used to treat patients whose prostate cancer has spread beyond the prostate. While most men initially respond to this therapy, the cancer nearly always returns and is often aggressive and lethal. We have discovered a mechanism that causes progression to this aggressive form of prostate cancer, providing a new opportunity to prevent or treat lethal forms of prostate cancer," says co-senior author David Goodrich, PhD, Professor of Oncology in the Department of Pharmacology and Therapeutics at Roswell Park. "Importantly, these findings offer a new understanding of prostate cancer lineage plasticity, which involves the conversion of cancer cells that are dependent on a specific therapeutic target to cancer cells that are now indifferent to that target's function," adds co-senior author Leigh Ellis, PhD, Assistant Professor of Oncology in the Department of Pharmacology and Therapeutics. "This discovery offers the possibility to reverse or delay lineage plasticity, thereby prolonging the effectiveness of the currently used therapies, like androgen deprivation. And this new understanding has the potential to be applicable in other types of cancers." Using preclinical models, the scientists demonstrated that loss of the tumor-suppressor gene known as Rb1 induces lineage plasticity and metastatic progression of prostate cancer. They also show that increased expression of another gene, Ezh2, is associated with lineage plasticity and may be therapeutically exploited. Treatment of resistant tumors with drugs that inhibit the Ezh2 gene may resensitize prostate cancer to androgen-deprivation therapy. The team expects to pursue these findings further in clinical studies at Roswell Park. Why not look more at the genes that change in the metabolism of 20-40 year old males, compared to 40-70 year old males. Prostate cancer is just one more of the many genetic default program of aging diseases (diseases primarily associated with aging). Let's look harder at stabilizing the genetic program of healthy youth rather than to trying to treat all the disease create by genes telling the body to essentially shut down and die. Yes, I know that farming the aging is the business model of big pharma, but that has to change because we simply can't afford to do otherwise. The implications of the lack of ethical and moral direction of big pharma's avoidance of cures and focus on treating diseases are extraordinarily negative.